Total hip replacement surgery is advised in patients for whom the hip joint has been so severely damaged by osteoarthritis, that it is no longer possible to preserve the natural joint through hip resurfacing. 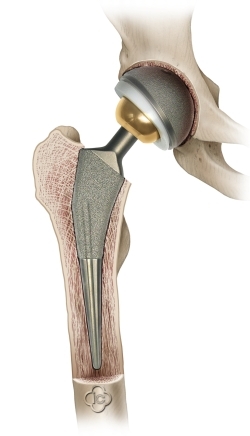 In this case, both the femoral head and the socket of the hip joint are replaced by metal and polyethylene components designed to restore pain free mobility. 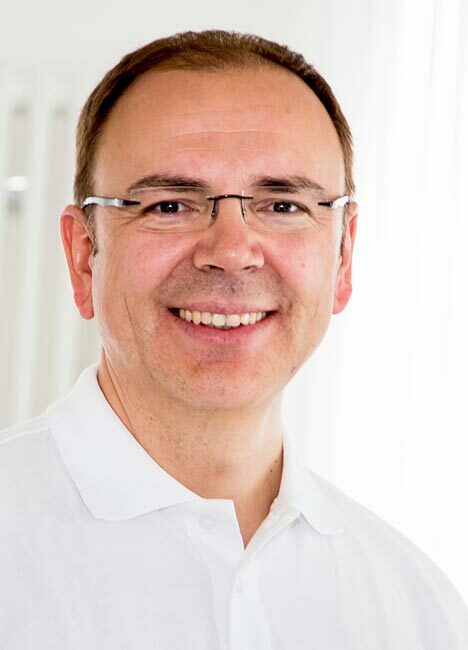 At the Gelenk Klinik our hip specialist is able to offer different designs and materials for the replacement joint and will advise on the most suitable for each individual case. The quality and durability of the hip replacement is largely dependant on the expert diagnosis, skill and experience of the hip specialist. However total hip replacement surgery is one of the most tested and successful joint replacement procedures available today. 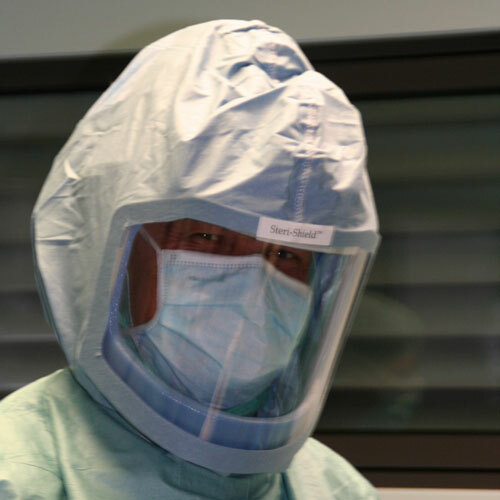 Closed circuit helmet systems create a clean-room atmosphere by preventing the spread of airborne germs by the operating theatre team. The quality and durability of hip replacement is largely dependant on the skill and experience of the hip specialist. 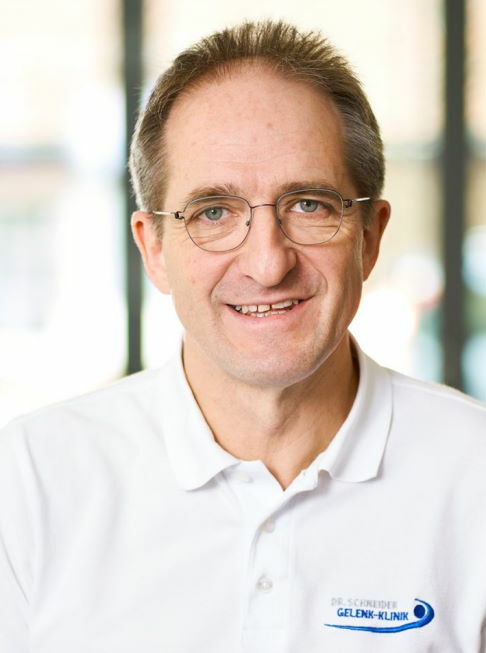 Orthopaedic Gelenk-Klinik has a dedicated hip surgeon as head of the hip department with the experience of hundreds of hip replacements each year since 2004. Hip specialist Dr. Schneider uses a particularly minimally invasive surgical technique by accessing the joint through the gluteal muscle. The muscle fibres and nerves are pushed aside (similar to walking through a curtain) without damaging the muscle and leaving only a small scar. Patients undergoing minimally invasive hip replacement surgery at the Gelenk-Klinik are mobile the day after the surgery and experience quick and pain free rehabilitation. The certification of the German Orthopaedic Society DGOOC as Centre for Arthroplasty in Germany indicates high quality in hip prosthesis. The certificate measures experience and quality of results in arthroplasty. Dr. Schneider has successfully proven his experience of over 100 successful hip prosthesis surgeries per year in order to fulfill the requirements of this certificate. First the femur (thigh bone) is separated from the hip socket. Next the damaged "ball" at the head of the femur is removed as well as any damaged cartilage and bone from the hip socket. A metal shell is then pressed into the hip socket and held in place by the press fit procedure. A plastic liner is fitted into the metal shell, completing the socket. The surgeon then works on the "ball" implant at the head of the femur. First the end of the femur is hollowed out, next the shaft of the metal implant is inserted deep into the thigh bone and may be secured using bone cement. 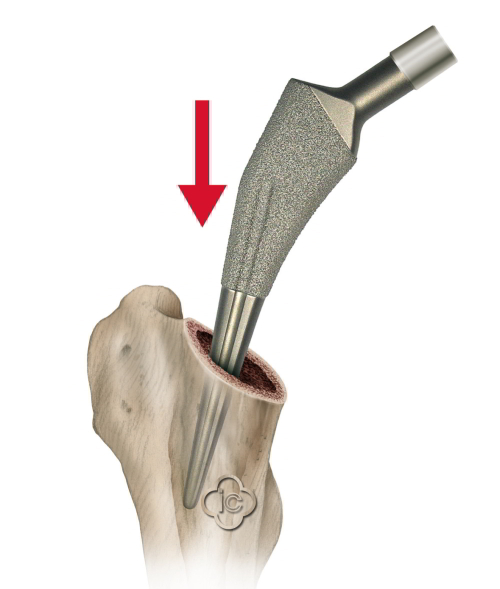 A metal or ceramic ball component is attached to the head of the shaft to complete the "ball" implant. Finally the new ball and socket components are joined to form the new hip joint. Securing the prosthesis with bone cement has the advantage of enabling the joint to return quickly to full weight bearing capacity. Mobilisation is usually possible as early as the first day after surgery. Cemented prostheses however, are not recommended for cases in which the stem of the prosthesis may one day be required to be replaced. Elderly patients or patients with lower bone density (osteoporosis) benefit from the fast rehabilitation and rapid mobilisation possible following a cemented implant. The younger and more active the patient, the more likely an ingrowing prosthesis is recommended by our hip specialist. The socket of the prosthesis will be fixed by the cement-free press-fit procedure. The stem of the hip prosthesis has a rough surface that encourages the natural ingrowth of bone structure. This provides a result that will be more resilient in active and sporty patients. Bone cement on the other hand is brittle and has a tendency to erode under stress and regular high impact, it is therefore unsuitable in these cases. Some younger patients who are given an ingrowing hip implant, even go on to participate in long distance running events. For the majority of people however, this is not usually recommended and caution following hip replacement surgery is advised. The speed of rehabilitation following a hip replacement will vary according to how the prosthesis has been fixed in place. When bone cement is used to secure the prosthesis, full weight bearing is possible almost immediately. If the prosthesis is not cemented into place, it is necessary to allow four to six weeks (for the femur bone to "grow into" the implant) before the hip joint is able to bear full weight and walking without crutches is possible. 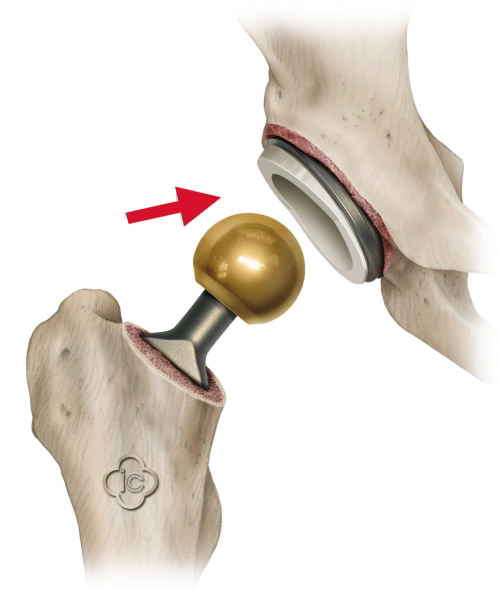 The main risk after hip replacement surgery is dislocation of the new hip joint (the ball jumps out of the socket). To prevent this, bending must be avoided. 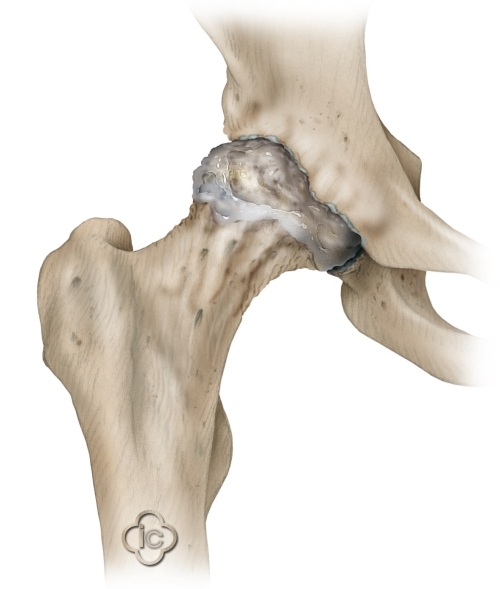 Dislocation is possible because during hip replacement surgery the capsule surrounding the joint is removed. After six months the capsule will have grown back and the risk of dislocation is back to normal again. Driving a car is normally possible within six weeks of hip replacement surgery. Return to work is usually advised after six weeks of rehabilitation (twelve weeks should be allowed for professions which require long periods of standing or walking). Sports which are safe to practise following a hip replacement include: cycling, nordic walking and hiking, swimming (front crawl only), gymnastic exercise, sailing, canoeing and rowing. Sports which must be practised with caution include: cross country skiing (risk of falling), jogging and running, golf and lifting weights heavier than 20% of body weight. Sports to be avoided include: alpine skiing, football, squash, tennis, skydiving, karate and judo. How long does a Total Hip Replacement Replacement last? Providing the new hip joint does not come under abnormal levels of strain, is not affected by accidental damage or through sport, the hip prothesis normally lasts between fifteen and twenty five years.